TAMPA, Fla. (AP) — Tampa Bay‘s DeSean Jackson is eager to put one of the least productive seasons of his NFL career behind him. The speedy receiver joined teammates for the start of the Buccaneers‘ offseason conditioning program this week and reiterated one of his priorities is improving on-the-field chemistry between him and quarterback Jameis Winston. Jackson signed a three-year, $33.5 million contract in free agency in 2017, however the Bucs struggled to fully integrate him into an offense counting on him to be the kind of dynamic playmaker he was for nine seasons with the Philadelphia Eagles and Washington Redskins. It didn’t help that Winston was slowed much of the season by a shoulder injury that forced him to miss games for the first time in his career. And when the two were on the field at the same time, the 24-year-old quarterback rarely was able to connect with Jackson beyond 20 yards downfield. “It was frustrating, but it’s a part of the process,” said Jackson, who had 50 receptions for 668 yards and three touchdowns in 15 games — his least productive season since 2012 (45 catches, 700 yards, two TDs in 11 games). 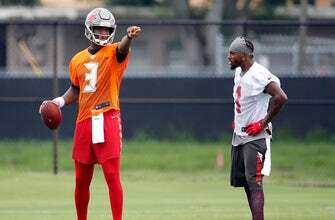 “Dealing with a quarterback like Jameis, a younger guy, he’s finding his niche and still trying to be everything they’re asking him to be and be accountable for that,” Jackson added. Jackson averaged a career-low 13.4 yards per reception. And for the first time as a pro, he failed to have at least one catch of 60 or more yards in a season. The 31-year-old’s longest reception during a season in which the Bucs finished 5-11 and missed the playoffs for the 10th straight season, came on a short catch he turned into a 41-yard gain against New England. “As a football team collectively, I think everyone has their work cut out for them. And as long as we put in the time, which is here on the field and in the meeting rooms, that’s all you can really ask for,” Jackson said. Jackson recently accepted Winston’s invitation to join the quarterback for two days of work at Florida State, Winston’s alma mater. “I was able to get down there to his stomping grounds, his roots in Tallahassee. We got a little bit of work done. It was just a part of the process,” the receiver said. Jackson is not sure how long he’ll remain in Tampa for voluntary work the team began Monday. He’s spent the bulk of his offseason in California throughout his career and has no plans to change a routine that’s been a big part of his success. Nevertheless, he felt it was important to “show face” for the start of the conditioning program in Tampa, where he briefed coach Dirk Koetter and teammates about his plans.